When I found out that I was pregnant with Amy, I instantly had an idea about what sort of mum I wanted to be. I wouldn’t allow her to watch TV until her third birthday (what was I thinking!? ), we’d do a different craft project a day (yeah, right!) and of course, she would only eat organic and home-cooked meals. Little did I know that sleep deprivation and constant breastfeeding would make me less than eager when it came to preparing organic baby food every single night. We mainly followed the baby led weaning route with Amy – she’s always been quite independent and never really liked being spoon-fed, but on some occasions we made use of some of the many organic baby products readily available in supermarkets. Amy was a big fan of finger foods such as the Organix Rice Cakes and herb puffs. They made a great snack on long car journeys or in between meals – plus they allowed her to feed herself, something that Little Miss Independent really appreciated. Other favourites of hers were the Heinz Biscotti and raisins. Boy, did she eat raisins as a baby. It really was unreal. They were a healthy snack though and baby nutrition was something that I really looked into when Amy started her weaning journey. It was important to me that Amy would get all the nutrients and vitamins that her little body needed to grow and reading toddler cookbooks and nutritional guidelines were something that I found really interesting during the first months of her life. Making your own baby food seems really time-consuming, but it is really worth it as it introduces your child to a great variety of natural flavours and you can keep a look on what enters their body. Amanda Ursell’s Baby and Toddler Food Bible was a great book to refer to for nutritional information and the needs of babies and toddlers, whereas Pinterest was invaluable for inspiration and creative flavour combinations. Making your own baby food isn’t for everyone and as I said, we mainly went down the baby led weaning route, but if you want to get a bargain on healthy and organic baby food, make sure to check out the Tesco Baby Event. You can even win a fabulous seven-night family holiday at Walt Disney World, Florida, if you’re lucky! What’s not to like? Loved this post-with my post I was adamant I would make everything from scratch but breastfeeding and sleep deprivation often made it hard and I was being too tough on myself…there are so many wonderful organic baby ranges out there so I supplemented the early food with those. With both boys they eat what we eat but I rely on rice snacks and baby crisps for snacks. A combination! I know home cooked food is the best but sometimes when out and about shop bought food is good enough. Both my girls were BLW so the puree period was not for long so that being sad we didn’t have big problems when out and about either – bananas, grapes good. I made most of our purées the first time round but for my second I used more shop bought stuff as I had a three year old to cook for too so had less time. I did a bit of everything with mine but when you’ve got two to tend to it’s the only way! And I’m pleased, they eat a bit of everything and are ‘nice and healthy’ too. 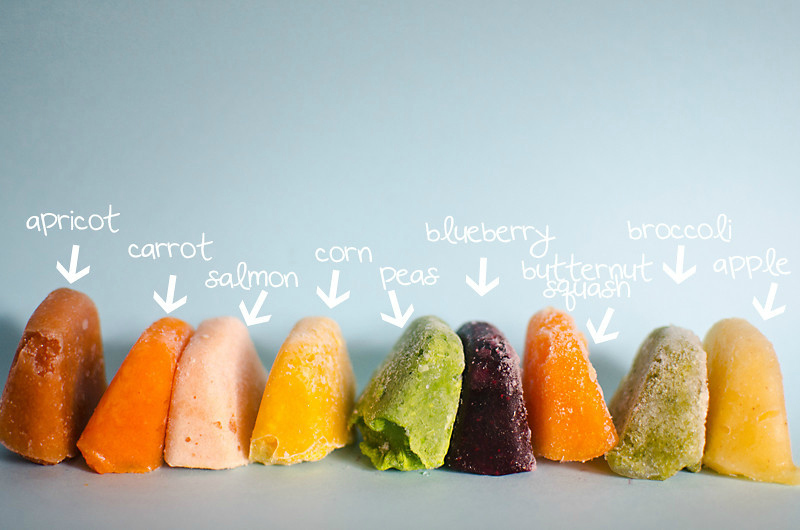 Homemade baby food all the way! It’s really quite easy to make and can save you a ton of money.